The Mortal and Divine Planes are two separate, yet closely related worlds. The Mortal Plane was created first by the High God; a paradise in which all beings lived in harmony. Once the High God realized that the Mortal Plane could not truly be perfect unless its inhabits chose goodness over evil, choice was introduced into the world and everything changed. In order to personify the choice between good and evil, the High God created a pantheon of lesser gods: the Gods of Light and the Gods of Darkness. The Divine Plane was then created to give the lesser gods a place to reside. No Mortals were allowed to trod upon the Divine Plane, but the gods were able to walk the Mortal Plane below until Lio, a God of Light, slew Xyxax, a God of Darkness. The two planes are connected via Aenna, a glowing "window" in the sky of the Mortal Plane. The gods are able to look through a basin of Divine Blood in the Divine Plane that shows them the world below through the window of Aenna. It is also through Aenna that travel between the two planes is possible. Illux is the capital of city of the Mortal Plane, and the center of the worship of the Gods of Light. The city originally held farmlands within the walls, but once the population began to grow the farms had to move to villages outside the city. What replaced the farmlands outside the inner city were miles of slums; ramshackle houses and hovels stacked atop each other. In these slums lack of food and poor living conditions breeds crime and misfortune of the worst kinds. Surrounding Illux a giant wall of white stone, with great golden gates to the North, South, East, and West. The walls are manned by Paladins and members of the City Watch both. The walls have never fallen to a siege, and usually are enough to keep the forces of Darkness from attacking the city directly. At the heart of Illux lies the Grand Cathedral, a towering building consisting of five spires. Each of the spires in the Cathedral is dedicated to the worship of a different god. Each of the four lesser spires is dedicated to one of the Gods of Light, while the larger, central spire is dedicated to the High God. After the fall of Lio, the Northernmost spire was made the command center of the Paladin order and residence of the Seraph. Since this event it has become known as the Forth Spire. The second-largest settlement upon the Mortal Plane, Seatown is quite a bit younger than Illux. Seatown formed as the hub of all fishing activity along the coastline. The majority of food that flows to Illux comes from Seatown, though this bond does little to actually strengthen the ties between the two. Seatown wishes to be independent from the control of Illux, and the Paladin leadership there does little to hide this fact. The years since the coastal city was founded have been relatively peaceful, adding to the feelings that Seatown doesn't need the safety that Illux provides. The city itself is surrounded by a small wall for protection, with limited entry through the front gates. A criminal element has sprung up in the town lately as well, making it a prime spot for wilderness bandit's to sell stolen wares. The expansive mountain range to the north of the Mortal Plane still retains its name from when the High God originally created the world. The Rim is home to all manner of creatures and rugged terrain, which keeps any real settlements from popping up anywhere north of the foothills. At the base of the mountains are the grazing grounds for the northernmost villages. Founded by the Grey God to house his subjects, the Grey Temple lies nestled in the eastern corner of the Rim. The Balance Monks who live in this sacred place all journeyed here from the lands below, choosing to live a peaceful life in service to the Grey God rather than blindly follow the Gods of Light or the Gods of Darkness. Surrounding the temple are practice fields in which the Balance Monks practice their martial prowess in case the grey God ever calls upon them to do battle with the Forces of Light or the Forces of Darkness. Lower on the mountain below the Grey Temple are fields that the monks take turns working to provide food for the others. The Temple is completely self sufficient and has little to no contact with Illux or the other villages. The Great Chasm is the site where the God of Light, Lio, killed his rival Xyxax, the God of Darkness. The battle between the bitter enemies was so intense that it raged on for three days. Finally, Lio struck Xyxax down, casting him into the earth. The crater that formed where the dark god fell became known as the Great Chasm. Nothing grows anywhere near this place, and it exudes such a palpable malevolence that even the servants of the Gods of Darkness are afraid to be anywhere near it. Aenna hangs in the sky like a second sun, never moving, always visible even on the darkest of nights. Aenna is the opening to the Divine Plane, the window that connects the two worlds. It is through Aenna that the gods look down upon the Mortal Plane when they gaze into the Basin. When a god is killed, Aenna visibly dims. If all of the gods where to die, then Aenna itself would be no more. Home to the Gods of Light, Ayyslid is a fortress made of living wood. The trees that intertwine to form the fortress move and change as needed, forming doorways and furniture as the gods need. There are no candles in Ayyslid, for the entire structure glows of its own luminescence. Home to the Gods of Darkness, Infernaak consists of one central island and several lesser islands surrounded by rivers of lava. Upon the central island is a giant black bell that the normal solitary Gods of Darkness ring to call meetings. 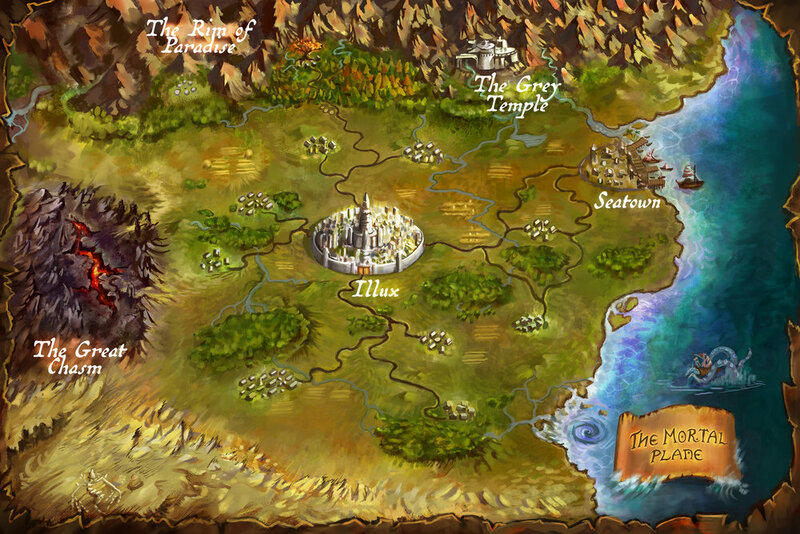 Each of the outlying islands holds a large tower in which one of the Gods of Darkness resides. There are currently three outlying islands, the fourth sank into the lava the day Xyxax died. At the center of the Divine Plane lies the High God's Throne, an immense chair made of the same stone as the central third of the world. It was here that the High God sat in judgement over all of the world. Since Lio killed Xyxax the throne has sat empty. North of the High Gods Throne is a circle of pillars in which Ravim, the God of Balance, sits in eternal meditation. From here the Grey God communicates with his followers in the Grey Temple and considers the current state of balance on the Mortal Plane below. At the base of the High God's Throne is the Basin, a giant bowl filled with the silver blood of the gods. The Basin allows the gods of the Divine Plane to look down on the world below through Aenna. Stepping into the Basin also allows the gods to venture onto the Mortal Plane directly.